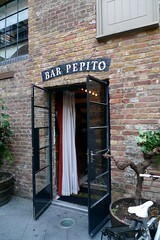 A very small bar specialising in sherry, across a courtyard from its parent restaurant, [Camino]?, near King's Cross Station. The bar itself has only a small counter with fridge units for the sherries, and four high tables with tabletops made from sherry barrels and four stools around each. The rear of the space also has storage for their sherry bottles (which they sell at trade prices for taking away), and an Enomatic machine to dispense small quantities of several sherries photo. There is no air-conditioning, so in the hot Summer months many of the customers will prefer to sit in the outdoor courtyard the bar shares with Camino (though as Camino opens earlier, the courtyard is often already quite full). The sherry menu focuses on a small selection across various styles: Fino photo of drinks menu p1; Amontillado, Oloroso seco and dulce, Palo Cortado drinks menu p2; Moscatel and Pedro Ximenez drinks menu p3. It also offers themed 'sherry flights' photo which broadly stick to these different styles, offering 50ml servings of three different sherries, and are priced around £8-£9 including a single portion of tapas (but more for the rarer sherries). The tapas menu is a basic one, designed to be prepared in the tiny bar space, and sticks to meats and cheeses photo of food menu p1 as well as smaller snacks and a few other items food menu p2. Almonds are served in their shells (£2) photo, while the anchovies (called 'Gilda') were served on skewers (£3.75) photo. Highlights were the simple but very tasty pan con tomate (£2.75) photo of 2 portions and the duck liver pâté (£4.75) photo, served with a jelly which had almost melted in the warmth of the bar. Meat plates were simple, a sweaty morcón ibérico served with one of the sherry flights, and a plate of tastier salchichón sausages, the picos ibéricos (£6.25) photo, served with small bread sticks. Best for sharing was probably the large plate of cheeses, the tabla de queso (£6.75) photo, which came with walnuts, grapes and more of those bread sticks. Ordering food and drinks can be hectic when the place is busy (as it was when we visited on a Wednesday evening), but the service is extremely friendly, and when he had a moment, our server stopped by to tell us about the sherries. Jugs of (iced) tap water were also provided promptly. By around 8pm, the place had quietened down a bit, suggesting it gains greatly from the post-work crowd commuting from the nearby station. Last visited by Ewan, Kake, Sarah and Kerry, 30 June 2010. Photos of menus taken on that visit. Opening hours taken from website, July 2010. Last edited 2013-05-10 08:25:25 (version 7; diff). List all versions. Page last edited 2013-05-10 08:25:25 (version 7).